Static electricity is a common cause of ignition in industrial facilities, particularly when loading and unloading tank cars and trucks with non-conductive liquids. The lady got in and out of her car a number of times. In doing so, she created a static charge on her clothing. 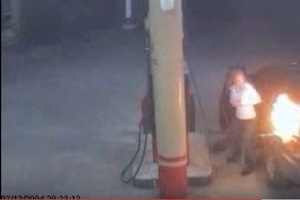 She then touched the handle of the gasoline hose. A spark was generated and the vapors around the nozzle were ignited. There are at least three lessons that can be taken away from this event — one of them is to do with unsafe behavior, but the other two are more positive. The immediate lesson is obvious: the lady filling her car should not have moved around while filling the vehicle’s fuel tank. In particular she should not have made contact with non-conductive surfaces such as her car seat. Static electricity is a common cause of ignition in industrial facilities, particularly when loading and unloading tank cars and trucks with non-conductive liquids. It is essential that all equipment be properly grounded. 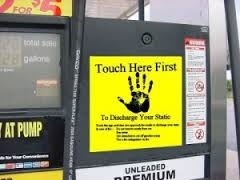 Some fueling stations provide a static discharge feature, as shown.